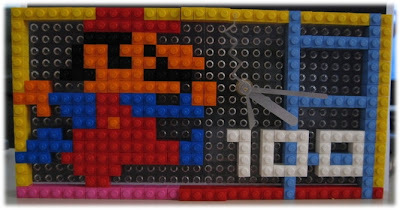 Another DIY Donkey Kong Clock…With Legos! It’s a pretty self explanatory project but there are some specific instructions. 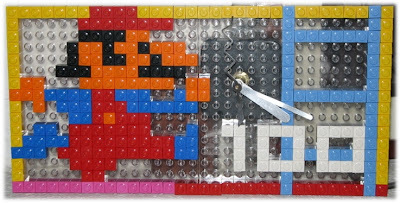 You’ll need to drill a hole into the Lego sheet in order to install your clockworks. Make sure you use the appropriate sized drill bit and GO SLOW. if you find that the clock fits a little loose in the drilled hole, you can secure it with some packing tape. Be creative, 8 bit sprites work the best but feel free to experiment. For a more secure fit use glue to affix your bricks to the board. This is definitely my favorite clock so far. It’s a great conversation piece and a really easy project to do while you’re watching TV or you’re just bored. Happy Crafting! All right! Time to get building. I’m gonna try some larger sprites, probably SNES or GBA sizes. That is, if the bricks have the proper colors. Nice clock! where did you buy the clock kit? how do i find one?